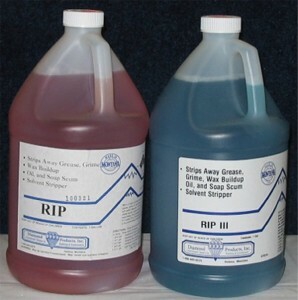 Rip is an excellent stripper/degreaser, highly effective at removing grease and grime buildup found in grout and tile floors, walls and throughout the kitchen. It is a non-ammoniated, water based solvent cleaner degreaser for use in a wide variety of applications. It is safe and effective on all metal, glass, sealed woods, quarry tile, and marble floors. Try it anywhere that needs heavy duty cleaning. For lighter duty cleaning, simply dilute to the concentration that does the job best for you. Can be used in cold or hot water.